UCM is an open source format for common chemical data. It is based on XML (Extensible Markup Language) and aims to utilize the advantages provided by XML technology. The first version of UCM, developed by Jan Mokrý and Miloslav Nič, focuses on the recording of chemical structures and their properties. Further information is available in our detailed preprint articles published in PeerJ Computer Science. The first article discusses the process of UCM development while the second describes the UCM format. In addition you can browse all supplementary materials offered on this website. Contains 8 UCM structure elements without 3-dimensional coordinates. See descriptions for the currently loaded UCM structure element (click the "Descriptions" button). 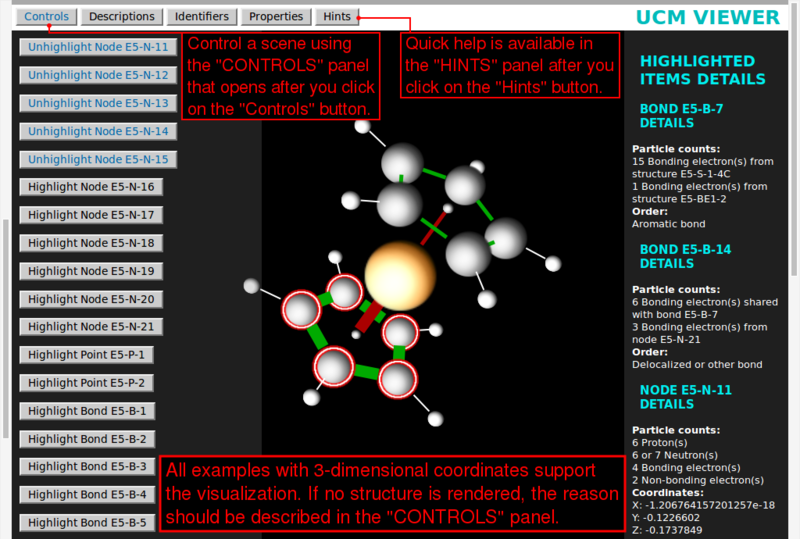 Load the next UCM structure element using available controls (click the "Controls" button). View the source code of the whole example (select the "View Page Source" or similar menu item offered by your web browser). Contains 1 UCM structure element with 3-dimensional coordinates. The visualization should be rendered and adjustable using available controls (click the "Controls" button). Loaded descriptions and identifiers may be viewed (click the "Descriptions" or "Identifiers" button) as well as the source code of the example (select the "View Page Source" or similar menu item offered by your web browser). Contains 1 UCM structure element with 3-dimensional coordinates and 1 UCM structure element without 3-dimensional coordinates. The visualization of the first UCM structure element should be rendered and adjustable using available controls (click the "Controls" button). The second UCM structure element does not support any visualization, because it contains a structure of ethane recorded using SMILES format (without 3-dimensional coordinates). Loaded descriptions, identifiers and properties of the first UCM structure element may be viewed (click the "Descriptions", "Identifiers" or "Properties" button) as well as the source code of the whole example (select the "View Page Source" or similar menu item offered by your web browser). Contains 2 UCM structure elements with 3-dimensional coordinates. The visualizations of both UCM structure elements should be rendered and adjustable using available controls (click the "Controls" button). Loaded descriptions of both UCM structure elements may be viewed (click the "Descriptions" button) as well as the source code of the whole example (select the "View Page Source" or similar menu item offered by your web browser). Loaded descriptions may be viewed (click the "Descriptions" button) as well as the source code of the example (select the "View Page Source" or similar menu item offered by your web browser). Contains 11 UCM structure elements with 3-dimensional coordinates and 9 UCM structure elements without 3-dimensional coordinates. For all UCM structure elements with 3-dimensional coordinates the visualization should be rendered and adjustable using available controls (click the "Controls" button). Remaining UCM structure elements without 3-dimensional coordinates do not support any visualization. Loaded descriptions, identifiers and properties of the current UCM structure element may be viewed (click the "Descriptions", "Identifiers" or "Properties" button) as well as the source code of the whole example (select the "View Page Source" or similar menu item offered by your web browser). Here we offer the complete UCM 1-1-1 software package with specifications as well as the corresponding online version of the documentation. The complete UCM VIEWER 1-1-1 software package may be downloaded below. After downloading and extracting the package you can open the "Ucmv.html" file in a web browser. This should load UCM VIEWER 1-1-1 interface, which is slightly adapted for offline usage (i.e. UCM files are opened using a file chooser dialog). Of course another possibility is to directly open the XML files with UCM examples in your web browser (it will load UCM VIEWER 1-1-1 online interface without the file chooser dialog). UCM design is based on examining other formats for common chemical data using a two stage analysis procedure devised for both XML and non-XML formats. To effectively handle the processing, updating and storage of all information about various chemical formats we utilized DATA FORMATS ANALYZER and a specific work-flow (it combined Google Spreadsheets for collaborative editing and custom XML files for data storage). Because similar work-flow could be used for analyzing other data formats, we offer DATA FORMATS ANALYZER for download as open source software. While in the first stage the focus was mostly on gathering information about analyzed formats, during the second stage we performed the detailed analysis of selected formats with the most general-purpose chemical functionality. The obtained knowledge about the benefits, issues and concepts of analyzed formats was utilized in designing the concise structure for UCM. * Marked formats were included in the second stage of our analysis. Below are provided the interactive XHTML (Extensible HyperText Markup Language) references generated with DATA FORMATS ANALYZER 1-1-1 during the first stage of our chemical formats analysis. In the case of NCBI XML schema files, we generated references specifically for chosen modules describing XML formats for chemical data. * Marked abbreviations are non-official and were used only for the consistent naming of generated materials. The complete DATA FORMATS ANALYZER 1-1-1 software package can be downloaded below. In addition it is also possible to browse the corresponding online version of the documentation. Last updated on 2015-09-03. Author: Jan Mokrý .